To balance Injection quantity deviation among injectors, Toyota developed a software compensation method for the new common rail system, which compensates injection quantity deviations among the injectors. Specifically, by adopting a two-dimensional code, each injector has a 30 digit code that contains its own deviation. The engine ECU then reads deviations of the injectors during assembly and compensates for them. As a result, the system can keep performing injections with required small fuel quantities, at high accuracy during its operation. Condition: Toyota Software version must be V31.03 or above. CAN BUS II connector is selected in this operation. After download Toyota Software and enter Engine system, click WORK SUPPORT in the function menu interface，see Fig.1. 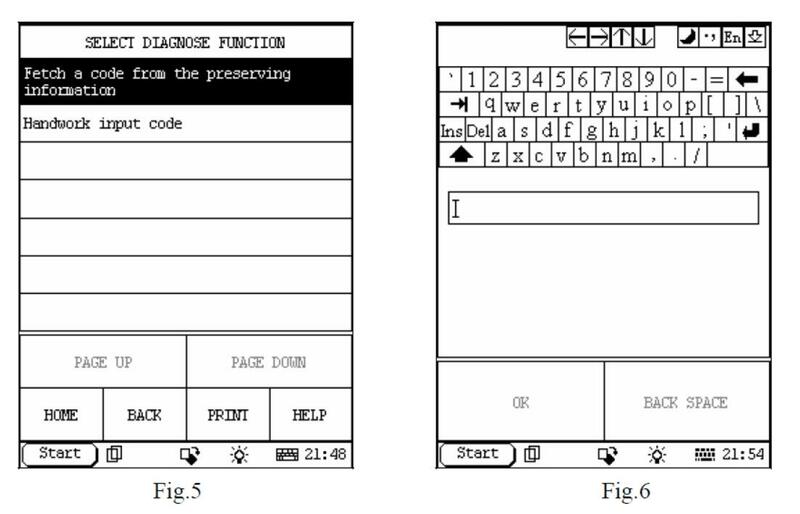 Then X431 will search all available special functions for this system and display it as Fig.2. Clink Injectior Compensation to enter next menu, see as Fig.3. 1.Set Compensation Code: is defined to write new injector code into ECU. 2.Read Compensation Code: is used to read each injector code information from ECU memory. 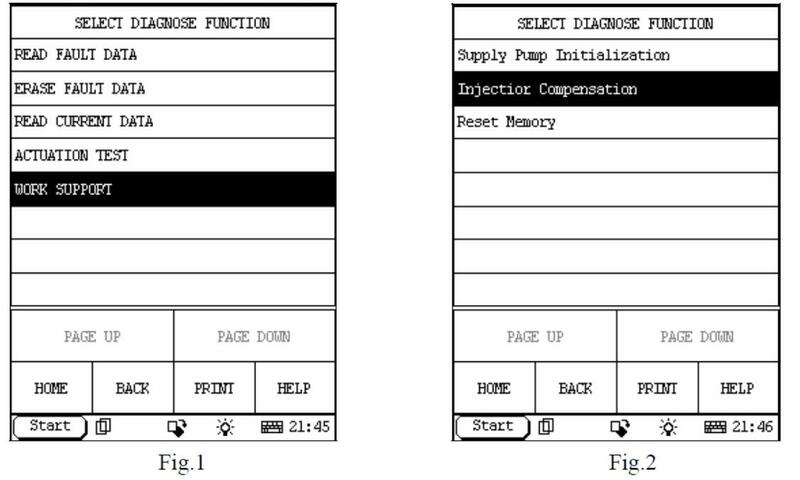 You must select an injector that you want to perform this function after you click any above item displayed in the fig.3 interface, see as Fig. 4. Read Compensation code function is very useful when you forget the injectors corresponding position after they all are removed out and disarranged. You also can save the code after you perform this function. Set Compensation Code contains 2 items: Fetch a code form the preserving and Handwork input code, see Fig.5. The previous function is used to fetch the saved code if you have performed Read Compensation code, it is convenient to match any injector that its code can be fetched from preserving if you only change injectors position each other without replace any one. 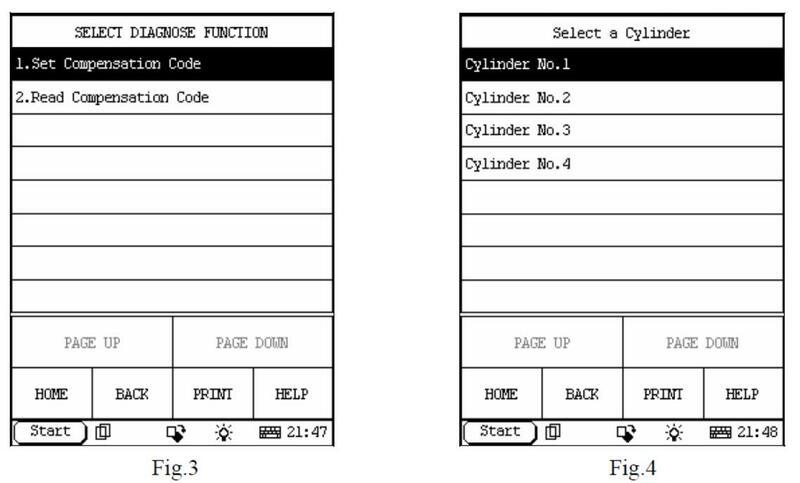 The latter Handwork input code is used when new injector(s) is installed, because the new injector code is not memorized in the ECU, so you have to input it by hand to match. The input code interface is shown as Fig.6.